When a right-sided trocar site coincides with the desired stoma site, the trocar site is extended 4.5 cm. 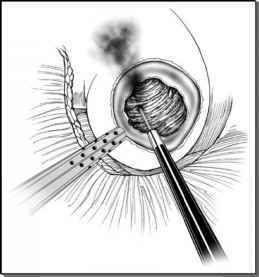 When the stoma site is separate from all trocars, a 4.5-cm infraumbili-cal incision is made. The specimen is retrieved. The color-coded ureteral holding sutures are exteriorized. A 15-cm segment of ileum is selected with care to spare 15-20 cm proximal to the ileocecal junction. The efferent limb should reach the previously marked stoma site without undue tension or mesenteric kinking. The segment of bowel is delivered through the incision and isolated with a GIA stapler by transecting proximally and distally. The mesentery is divided below with care to preserve the major mesenteric vasculature. The isolated segment is dropped posteriorly. A previously marked stoma site away from desired trocar sites should not compromise optimal port placement (Fig. 1).